Matthew McConauhey will play a role in a movie called White Boy Rick. Yann Demange’s White Boy Rick focuses into the background of Richard Wershe Junior. This is a story about a Detroit young teenager who was living his life in harsh walls of prison. He was a Federal agent and works as a cover agent during the war against drug and crimes in the 80s. Unfortunately in the long run he turns to be a criminal and was ultimately got caught and disappear to the cold difficult life of prison. His sentence is to spend all his life in very harsh walls of the prison. He is telling his story to some people so that they will learn about his life. 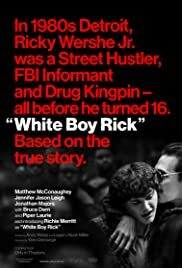 If you are looking for a movie that has great story, then White Boy Rick is probably the ideal one. Watching the movie will give you lots of questions floating over your head. Of course, since this movie is field with prisoners, gangsters and criminals, it is expected that you can see any lawfulness and lawlessness in the screen. In the movie you can also learn how the FBI uses people in order to accomplish their mission in the expense of the life of an innocent young boy.